There is inevitably an adjustment period for any international students as they make the transition to American foods. This is particularly true for young people coming from China. Raw vegetables, ice water, rare steak, cereal or salads. Chinese students will be accustomed to eating three hot meals a day. Some Chinese dishes are served cold, but more than likely the ingredients of the cold dish were cooked first, then refrigerated. 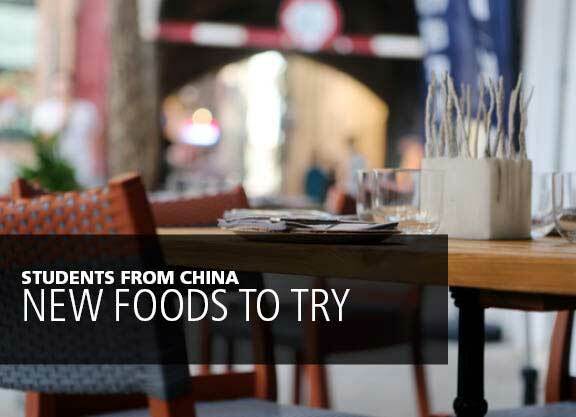 At home in China, students typically do not eat uncooked or “cold” foods like sandwiches, cereal or salads, which we know is a mainstay of American breakfasts and lunches. The rule of “always-cooked-food” will likely cause your student to dislike other American food items too, like raw vegetables or rare steak. A distaste for cold food may even extend to certain things like ice water, which your student from China is likely to have never had before. Macaroni and cheese, grilled cheese sandwiches – really anything with cheese! For some of your students, many of the foods that they will try for the first time will have cheese as an ingredient. Whether it’s macaroni and cheese, a cheeseburger, or a simple cold-cut sandwich with a slice of cheddar (this is a double whammy, since it’s a cold sandwich), the texture and taste of cheese will be new to your student. However, many international students from China will have had a glass of milk before coming to the United States with a meal, so it’s not fair to say that dairy products are off the menu for your student. Partly due to social stigmas, cheese has fallen out of favor in many regional cuisines throughout China. Encourage Students to Try New Things. It’s best to be aware of these aversions to particular foods before your student arrives and to stock some foods that will be more familiar to them. However, it’s essential that your student try new food too, especially during the honeymoon period! Help Students Feel More at Home. We recommend preparing a meal with ingredients from the student’s home country – or an occasional trip to a restaurant serving their native cuisine – to help relieve the students of their homesickness. Host families should be sensitive to this adjustment period, but they should encourage their host student to keep an open mind as well. Sharing in the experience of shopping for and cooking a dish unique to the student’s home country is an excellent opportunity for cultural exchange. Research Foods Native to Your Student’s Region. Like other aspects of Chinese life, the cuisine is heavily influenced by geography and ethnic diversity. Research the home region of your student, perhaps even with your student, to better understand their palate. Among the main styles of Chinese cooking are Cantonese, which features stir-fried dishes, and Szechuan, which relies heavily on the use of peanuts, sesame paste, and ginger. Cantonese cuisine food is known for its spiciness. In Northern China, for example, wheat is eaten more than rice as a staple food. Food using wheat as its main ingredient, such as noodles and dumplings is prevalent there. China’s Southern cuisine uses far more rice, with such staples as rice noodles and zongzi – sticky rice wrapped in leaves. Southern food is typically spicier, and tea is the beverage of choice.